When I was young, I read countless books about marine life and the ocean. Growing up in New York, it was the only way I could really engage with the sea creatures that fascinated me. This early passion eventually turned into career path, as I know work as a professional underwater photographer. This early interest in nature books was my main inspiration behind wanting to write Please Be Nice to Sharks. 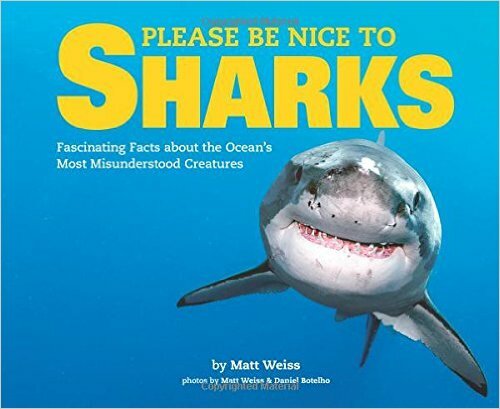 It’s my hope that someone will read my book and have the same reaction to the photos and fascinating facts about sharks as I did to the books I read when I was a child. If Please Be Nice To Sharks piques your curiosity about underwater photography, let me tell you, nothing compares to being in an ocean, pond, river or even a pool, and taking photos. While it might take some time before you’re in the open ocean with sharks, underwater photography can be a fun a family activity. If you’re heading to the beach this summer, or even just spending time in a pool, and want to give underwater photography a shot, here are some tips. Purchase an easy to use camera to start out. A camera like a GoPro or an Olympus Tough Tg-4 camera can be submerged underwater without any extra hassle. Just charge it up, get in and shoot away. Stay shallow. Light has a hard time penetrating through water, so the shallower you are, the more colors you will have in your photos. Snorkeling on sunny days can lead to plenty of pretty photos. Many of the photos taken in Please Be Nice To Sharks are while snorkeling! Get close. Even if you’re just taking photos of your dog in the pool, be as close to what you’re shooting as possible. Removing the amount of water between the camera and the subject will lead to a clearer, sharper, and more colorful image. If you’re lucky enough to be snorkeling in a stream, lake or ocean with lots of fish, get an ID book and look up the marine life you captured on your camera. It’s a fun way to learn more about marine biology, and feels a little bit like playing a game. In fact, it’s sort of like a real life version of the Pokemon game that’s so popular right now! Stick with it! Underwater photography is a little more difficult than “land photography” but it’s really enjoyable once you get the hang of it. I’ll leave you with a warning though – it’s addictive! Once you have the bug, you’ll love it forever.